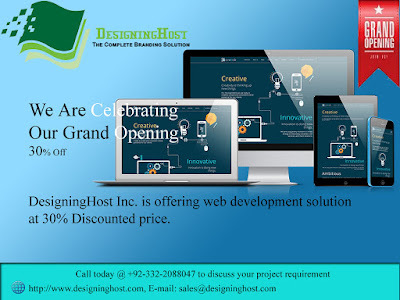 DesigningHost Inc. (DHI) is USA based Global IT Services Company specializing in Web Design & Development, Internet Services & Mobile Applications Development. Established in 2007, DHI has over 20 skilled professionals operating out of our state of the art Offshore Development Center in Karachi, Pakistan, UAE, USA, UK, Germany, France, Netherlands. Our gamut of services include Web Design & Web Development, eCommerce Solutions, Custom Web Design Portals, Digital Services, iPhone Applications Development, Android Applications Development, Facebook Fan Page Design, Web Hosting Services, Content Writing, Social Media Marketing & Management and many more. Please get in touch with us at +92 334 204 8248, sales@designinghost.com or simply fill ‘Request a quote’ form above to get a call back from us.